I am a full-time United States Coast Guard approved, licensed, Master Charter Captain, I am fully insured and my fishing equipment is top of the line. 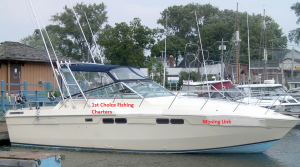 I run a 33’ Chris Craft Commander Salmon Fishing Machine Twin 350 Chevy Small Block motors. Cannon Down Riggers. Raymarine Auto Pilot All top of the line Shimano Reels, Rods and a Private Head. We know how to catch Salmon, Steelhead, Brown and Lake Trout on Lake Ontario come join me and our crew for a fun, safe fishing adventure on the Great Lake Ontario. This boat runs from early April till the end of September. Minimum of 4 people or $780 per 8 hours Maximum 6 people $1080.00 per 8 hours. Please see rates Page. All prices INCLUDE CLEANING and PACKAGING of Fish. I also run a luxury 21′ Lund fishing machine powered with a 225 HP Mercury motor also a Mercury Kicker motor 15 hp (when needed) equipped with Cannon down-riggers and rod holders (depending on fish species) when needed, Minn Kota Trolling Motor (The New Ulterra), Lowrance sonar electronics and VHF marine radio and now with Sirius XM Radio and Sirius Weather for up to the minute weather and for your safety. This boat is available 12 months a year. 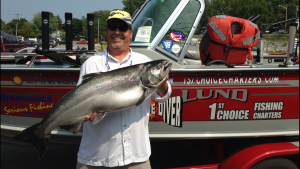 If you’ve never fished the Niagara River, you are in for giant surprise and big fish. The fast moving water flowing from Lake Erie over Niagara Falls and into Lake Ontario generates large amounts of oxygen, creating optimized habitat in the Lower Niagara River for fish to thrive at all times of the year. The Niagara Bar, where the Lower Niagara river reaches Lake Ontario, is known around the country for multiple species of fish as they congregate there at specific times of the year. During these hot fishing periods, you are in for incredible, drag-screaming, fish-catching good times!